My previous view was that Nifty is going through either a double or triple Zig Zag correction, but from here on 2 possibilities exist. Possibility 1 : Nifty is in a Wave 4 correction and will go on to make new highs or atleast touch the previous highs as failed 5th. The confirmation for the same will come when this upper trend channel line will be broken as discussed in the last analysis. Nifty can go higher if the upper trend channel line is broken. 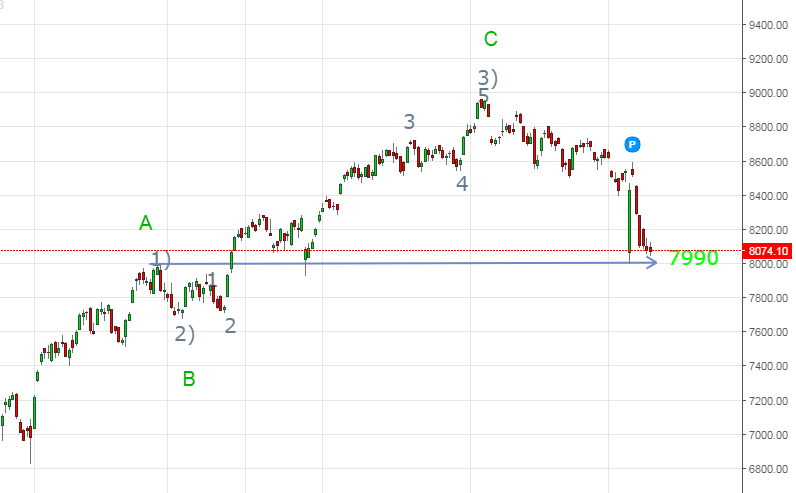 Possibility 2 : If Nifty goes and closes below 7990 and stays there for more then 1 session then we should consider the movement from 6830 to 8960 as an A-B-C correction up and the current wave as an 5 Wave down completing a Flat type of correction. Look at the Wave count for Possibility 2 in green in the chart below. However it’s a wait and watch situation as of now and since the downside Stop Loss is small I have entered into a long position. Conclusion : If Nifty closes below 7990 I will reconsider my counts and the view discussed in detail on 11th September 2016 will prevail. You can check this video to have a detailed understanding of my alternate view. View the previous Nifty Elliott Wave Report here.